I’m sure you’ve read or heard the sad news that vandals smashed up the historic font in St. George’s Church at the end of April. It was a distressing sight to see the font, which had come from the original Church, broken into so many pieces. At the same time, the Paschal Candle, or Easter Candle, was also destroyed. That’s the very large candle, standing nearly a metre tall, which was lit for the first time on Easter Eve. At St. George’s Church it’s also lit every time there’s a service to remind us that our risen Lord is always with us. 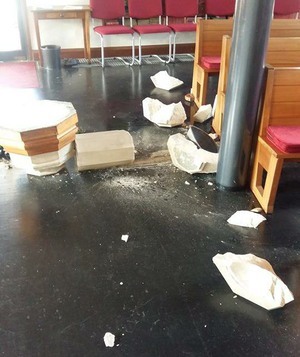 The vandals damaged two precious items, but more importantly, they’ve hurt and upset a great number of people especially those who were baptised in the font or whose family members have been baptised in it. Also hurt are those who gave this year’s Paschal Candle or witnessed it being lit from the Easter Fire. What happens next? The Candle has already been replaced in a moving ceremony on April 30th when the flame from the old, broken candle was transferred to the new one, which now stands proudly by the altar representing Our Lord. The original candle will remain in the Lady Chapel for the time being and will eventually be melted down to create new, small votive candles. It’s hoped the font can be repaired, and three companies are examining it to see if that’s possible. Certainly the base and pillar can be re-used, but the bowl may have to be re-cast. The Diocesan experts and the Insurance company are advising on this. In the meantime, a spare font is being used for Baptisms. The ministry of the Church will go on. What is so encouraging is the amount of support and sympathy for St. George’s from people in the town and from some far away – Australia, Canada and Germany. Offers of financial help have been received and a “Just Giving” page has been set up on Facebook. Offers too of un-used fonts have been received from four different Churches in Ryde, Havant, Copnor and Durham. St. George’s is extremely grateful and somewhat touched by these. St. George’s Church – the Parish Church for Waterlooville – will continue to be kept open during the day. It’s here for the whole community, and as well as all the community activities hosted in the Church and in the Hall, it’s vital that people are encouraged to pop in to spend time in quiet, praying and maybe lighting a candle. People who work or shop in the town centre need a space to get away from the business outside. The ministry of the Church will go on. It’s been a real privilege to be your Parish Priest over the last thirteen years. As Lynda and I leave, we wish you well and pray for you, the people of St. George’s. You are the real Church, far more important than a building. Our prayer is that the ministry of the Church will go on. It will! The historic font that has served for the Baptism of so many people in Waterlooville over the years, photographed after the mindless attack by vandals on Friday 21st April. If you have any information as to who may have been responsible, please contact the Police immediately.